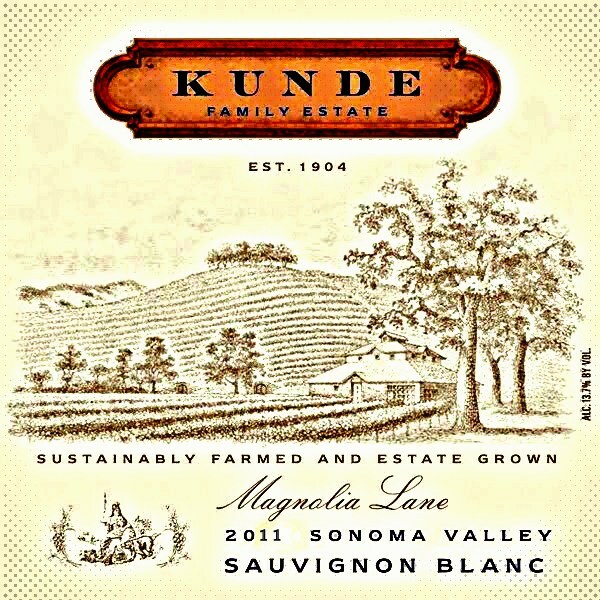 A funny thing happened on the way to the Kunde Taste Live; I stumbled over a Sauvignon Blanc that I want to put in the review spotlight. So today I'm recommending a Sauvignon-Blanc to each and every one of you. Oddly this is not something I thought I would be doing anytime soon; because to me most of these wines are predictably oh-so similar, loads of grapefruit, cut grass [freshly mowed] high-pitched citrus tone, uber enamel eroding high acid and other aggressive off-putting flavors. I've tasted far to many of those styles in the past and frankly I'm not impressed. So yes, I've been mocking the traditional style of Sauvignon Blanc for the longest time, save a well made Sancerre, but for the most part it's safe to say, I'm not a fan. I do so, to the disdain of many of my colleagues who dismiss my mockery as sheer folly. Be that as it may, in my not so humble opinion Sauvignon Blanc's high acid, aggressive grassiness and grapefruit aromas are great for cleaning the lint out of my stems and decanter before I pour a nice Cabernet Sauvignon or at other times its wonderful role in many recipes. Oh, speaking of Cabernet Sauvignon, we do at least have to recognize the fact that Sauvignon Blanc, along with Cabernet Franc; did at least get one thing right, helping to birth the wildly popular, stand up wine, everyone has come to know and love Cabernet Sauvignon. I know many of you love your Kim Crawford NZ style of Sauvignon Blanc and others, I say fine, drink it till your heart is content. Please don't let me attempt to dissuade you from your favorite wine; instead look at my criticism of the tried and true traditional style of Sauvignon Blanc, as an opportunity to see what just a pinch of Semillon [in this case late harvest] can do to alter this critic's opinion of Sauvignon Blanc. Why this method or style of wine isn't attempted more often is beyond me, I mean c'mon my mother always told me, "Billy, you can catch more bees with honey, than you can with vinegar" great point mom. A point that I hope more producers will come to understand more fully. In fact I would take it to the next level, I'd say hey everyone producing the “traditional” style of Sauvignon Blanc, "do you want to take a break from the fresh-cut lawn and the fresh squeezed grapefruit flavors, if so pick yourself up a bottle of the 2011 Magnolia Lane and uncork a whole new world of possibilities [new found customer base]. 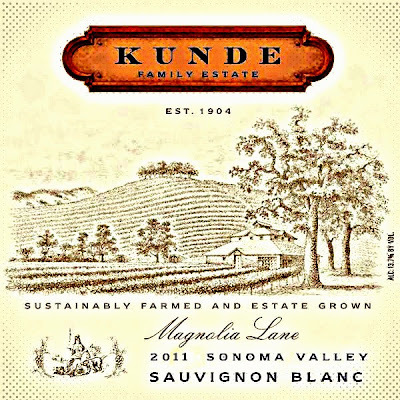 Hey Wine Bar owners, do you want to make a small fortune selling wines by the glass, if so the Kunde 2011 Magnolia Lane Sauvignon Blanc is made to order. One it comes in a fast server screw cap, two this wine is amendable to gas and three the style of this wine is very approachable on its own and will pair easily with a host of entrees or appetizers. Fourth, the price point is just stupid-good, don’t pass it up. You’ll will have a hard time keeping this wine in stock, don’t believe me, give it a swirl for yourself; it will make a believer out of you, as it has me. If I was selling this wine into a restaurants and or bars, I could unload the entire case count in just a week. Okay, in case you’re wondering what I’m making all the fuss about; it’s about the fact that it's rare for a Sauvignon Blanc, to ever make me want to drink the entire bottle. Yes, I saved the bottle in my refrigerator, slowly sipping on it night after night and it made me say “wow” every time [no easy task]. What does it mean, when I say it made me say, “wow” it means after having sipped and slurped my way through more Sauvignon Blanc than I thought was humanly possible, that this vino-sapien has finally come across one I could recommend, with an exclamation point. Here’s what I found so appealing about this wine, it’s approachable right away, dressed to impress, no fuss, no muss, just put a bit of a chill on it and wow you have a masterpiece of lingering Sauvignon Blanc decadence. All the rough edges have been gently sanded down via the small 5% of the wine, which was fermented and aged in neutral French Oak. The "piste de résistance" was the addition of just 1% barrel fermented [late-harvest] Semillon. Pouring myself a glass, wow a bright beam of straw in the core, this wine just screams [okay, maybe just shouts] "summer" is nearly here. Giving the wine a good swirl or two, the aromas had me thinking about Alice Cooper belting out, "schools out for summer". As a waft of ripe fruits; apples, honey and passion-fruit, with a splash of citrus, with a pinch of toast like a freight train. After the first splash down, I found a complex, yet creamy palate of tropical fruit flavors, apple slices, with just a squeeze of mango-honey zest framed in mouth-watering acidity which finishes vibrant and clean. So much flavor for so little money [SRP $17]. Thus my score for this wine is 90 points. A real block buster of finesse and charm. This wine definitely gets my highly coveted, "drink now and drink often recommendation". They do appear to have plenty of it in stock at the moment, but with summer approaching I imagine it will fly out the door quickly, don't hesitate. Folks honestly do yourselves a big favor, get after this wine, you’ll never look at Sauvignon Blanc the same way again, because this folks is how you attract more bees, you just need a spot of honey. That spot of honey in this case is Semillon; a great grape, that is fun to say and even better to drink, when it’s paired with its best friend in the whole-wide grape world, which is Sauvignon Blanc. Until next time sip long and prosper cheers!